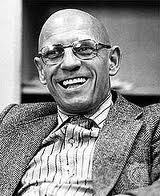 Author’s note: Any essay that starts out, “I have been reading Foucault,” is asking for trouble. You run the risk right away of being taken for someone who pretends to intellectual elitism (something I’d better not try to do). Plus, you damned well better sound like you have at least half a brain if you are going to discuss the work of someone as challenging as Foucault (that would be presumption number two on my part). But I couldn’t help myself. I had fallen under the spell. All I could hope to do was communicate some of my enthusiasm and, like any good convert, proselytize for the cause. I have been reading Foucault—again. Rereading. Unless you are as quick and clever as he is, you don’t just “read” Michel Foucault as if he were a mystery novel or an office memo. He frequently requires the kind of concentration you bring to the solution of a geometry theorem or the translation of an ancient text. I was never very good at either of those activities—mathematics or translation—with a few significant exceptions, significant because what I achieved in each case not only gave me confidence in the power of my abilities but opened up a brief but enduring view into the rich worlds of mathematical logic and Latin poetry. Had I been assigned Michel Foucault to read back then, I never would have made it through any of his books, never mind read them serially and with an eagerness that is more typical of the consumption of a fast-moving thriller. But that’s exactly what happened when I was looking for a book about the prison system and a neighbor offered me the copy of Discipline and Punish on his bookshelf left over from his graduate school days. I devoured it, then went on to Madness and Civilization, The Order of Things & The Archaeology of Knowledge, Psychiatric Power, was put off by the turgid prose of Birth of the Clinic, but soon discovered Foucault’s three volumes on sexuality, his final effort, half of the projected six volumes he had planned for the topic before he died in 1984. It wasn’t all easy reading, of course. Very little of Foucault is. But I always find him engaging, stimulating and manage to stay with him, the reward being exciting insights into how the world we live in has come about, especially what it owes to the intellectual world of the Enlightenment and the one that preceded it—the Renaissance—their “epistemes,” to use Foucault’s word, the way they saw the world and the systems of knowledge they devised to explain and control it. They were worlds as alien and exotic to our own as anything that might walk off a spaceship ship from another galaxy, and yet also familiar by their cultural residues if only (but certainly not only) in our popular art and common assumptions—what we call “magic,” e.g., actually the science of the pre-Enlightenment episteme. This was why as late as the mid-1600s a mind liked Newton’s (if there ever has been such a thing as a mind “like” his) could occupy itself most of the time with alchemy and the study of ancient Hebrew. It was probably never clear to Newton that the revolution he was effecting was a contradiction of the thousands of years of “science” that preceded him. He believed that all he was doing was rediscovering truths that the ancient Greeks had postulated that had been lost, just as Aristotle’s works were lost for more than a thousand years before being rediscovered at the end of the Middle Ages. Intellectual history was Foucault’s bailiwick, specifically 18th-century France, what we have come to know as the Enlightenment. In school we were taught it was a period much akin to our own, a kind of proto-modern way of thinking, when real science got started and notions of democracy and economics came into being. All of which is true, but, as Foucault shows, not in the way we think, and different in ways that are very important. The Enlightenment had its own assumptions and prejudices and models that are almost as alien to what was to come later as were the assumptions of the models that preceded it for two thousand years. I should probably point out that I delight in finding that the received truth is, if not exactly the opposite of what we think, very different from it, whether it’s the current unmasking of the vaporous frauds on which the world financial markets have operated for so many years or the exposure of common medical practices that cost so much and do so little for our health. Such unmaskings, slow at first, a few lone voices crying out that the accepted ideas or paradigms are really just conventions with no clothes on, only gradually become acceptable and even then only after the renegades have been roundly criticized or even persecuted: there really were no WMD despite the propaganda in the New York Times and the impassioned testimony at the UN of America’s most respected public figure; Credit Default Swaps are no better than last month’s lottery tickets; the sun does not revolve around the earth. By unearthing (he calls it archaeology) the origins and developments of the prison system, psychiatry and medicine generally and the other so-called social sciences, Foucault implicitly questions other precepts upon which our contemporary disciplines are founded. He reminds us of absurd notions we like to believe are peculiar to the unenlightened thinking of the past, even the not-so-distant past, such as the medical establishment’s “discovery” of masturbation at the start of the 19th century, thanks to new observational practices developed as a means of controlling populations in prisons, schools and hospitals. Freud himself was under the influence of this medical witch hunt which lasted well into the 20th century. It was as if, as Foucault remarks, an epidemic of self-abuse had broken out across Europe at the close of the 18th century. Modern medicine would also rather not recall some of the silly—”silly” if they didn’t ruin so many lives—other tenets and practices, such as bleeding for almost any condition, female clitorectomies (practiced mostly on white middle-class women, the class which has always been most medicalized), promoting the use of infant formula over mother’s milk, etc. There are plenty of contemporary equivalents to these useless or harmful nostrums, but we accept them as good medical science, physicians and patients alike. We cooperate with them every time we pay a visit to the doctor. But for me Foucault’s most fascinating subject is the pre-Enlightenment model of reality, the one that prevailed virtually unchallenged since the time of the Stoics, as meticulously constructed and rigorously practiced as anything that takes place in our own science labs. In this model the Creator passed on to Adam and Eve the language in which He himself thinks. It’s not language in the narrow sense we understand that word, because every word in it embodies the reality, the essential truth, of the object it designates and, as it were, incorporates, so that to know the word is to know the very being of the thing—or person. The consequences for scholarship and knowledge generally to such a concept are profound. Because we no longer have access to the primal master language (thanks to the Tower of Babel) we are reduced to approaching the truth via the watered-down derivative tongues we now speak. Even classical Greek and Latin are pale substitutions. Our job—the job of intellectuals from antiquity to the mid-17th century—was to “divine” the lost meanings and forgotten truths—what today we would call scientific data—we knew once simply by knowing the original language of creation. This was what magic was about. Today the word means skillful allusion, a pretense for entertainment, turning handkerchiefs into doves and cutting pretty girls in half only to put them back together again. But, in the old days, two, three, five thousand years ago, great minds could piece together the lost remnants of the true language of God as well as read the “marks” he has embedded in his creation for our understanding. As a result, they believed they could manipulate reality the way we do chemicals in a test tube—turn not just handkerchiefs but people into birds, transform lead into gold, read the future in the stars, cure the sick, even raise the dead. More practically, they could curse their enemies in a way that went beyond mere vilification. If you knew someone’s name, their real name, the word that contained their very being, you could—with the right verbal formula—kill them or at least make them very ill, a practice that goes back to the very beginnings of language, certainly written language, when the latter was the purview of a select elite. But the Creator did more than give man (and it was almost always “man,” wasn’t it) the true language. He also imbedded in his creation “characters” and “signs” that enabled the scientific whizzes of their day to understand how everything, literally every thing, in the universe was related to everything else and therefore how it could be manipulated, altered, transformed. We have our own received wisdoms and shibboleths that we accept as uncritically as did anyone in previous centuries, believing them to be based on good scientific evidence. To this day many of us seem to harbor a belief in the intrinsic value of gold, as the recent flight to that metal out of stocks and other less substantial financial instruments demonstrates. Is this so different from the Renaissance assumption that gold was inherently precious because God had created just enough of it to equal all the goods and services mankind would ever create? Is our current faith in more and more testing and aggressive treatment of patients (originally the word used for someone undergoing torture for the sake of discovering criminal truth), regardless of demonstrated risk and benefit, any better grounded than was the practice of bleeding and purging? Meanwhile, we still can’t get doctors to wash their hands before examining patients in the hospital, a lack of hygiene that costs thousands of lives each year. The beauty of reading a scholar as astute as Foucault is not that he poses any of these questions himself. As I say, he pretty much sticks to his professional last. But, his “archaeology” of the development of intellectual thought from the early 17th century into the 19th, allows us to hold up a mirror to our own time. We, like the people of other centuries, think we pretty much have figured out what it’s all about, apart from some tinkering around the edges—nailing down that pesky Unified Field Theory that has annoyed scientists ever since Einstein got a bee in his bonnet about it. The idea that our own science one day might be seen as flawed as that of the 17th century seems to us absurd. We are building, we believe, on hard-won truths, scientifically demonstrable truths, leaving nothing to speculation or faith. But Ptolemaic cosmology had seemed just as unshakably scientific, an elegant explanation for how the heavens revolve around the earth, cleverly explaining the odd backward and forward motion of the planets that seemed to contradict this hypothesis. It was such a rigorous piece of work that it lasted well over a thousand years and was discarded only with much reluctance and only after a good deal of persecution of those who contested it. Who are our own Ptolemies? Are they the scientific “studies” promising eternal life out of fish oil and statins? Are they those who affirm or those who deny global warming? Those who tell us our lives will be extended by their medicines and their machines or those who can demonstrate that longevity ultimately depends upon our socio-economic status and general satisfaction with life? Our own misguided scientists are operating within what we think of as the heart of orthodoxy. Which of them is actually telling us that the heavens revolve around the earth or that the cure for what ails us is a good bleeding? There are other kinds of anxieties and questions that reading Foucault or any other great scholar excites. But, if you’re like me, you thrill at the prospect of unmasking an accepted falsehood and seeing the way toward a new truth—with the proviso that truth is “a hypothesis that has not yet been disproven.” You not only weather the threat to the received orthodoxy but relish the intellectual vistas that take its place.